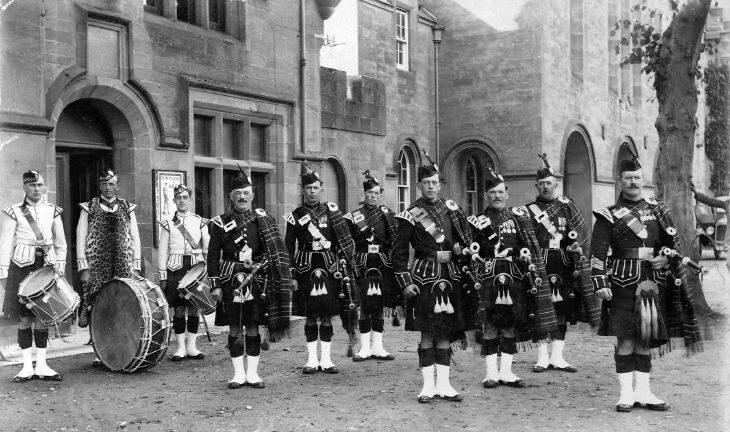 Mounted photograph of Dornoch Pipe Band outside the courthouse in 1926. States "old Doc Mclachlan on left" on back. This is the first photograph of the band taken after their formation in 1926. Left to right.Andrew Kenneth Fraser Draper, James MacDonald Gamekeeper, William MacDonald Hotel Porter, George Matheson Farm Worker, William Skinner Depute Town Clerk&First Secretary of the band. Angus Ross, James Murray Shop Owner, William Matheson Farm Worker, Thomas Murray Crofter, Hugh Grant Pipe Major &Gamekeeper at Skibo also Andrew Carnegies personal piper.